Maybe you’ve always dreamed of owning your own home. You’ve weighed the pros and cons of whether to build or buy, and you’ve decided to build! Congrats! But inquiring minds want to know…how much does it cost to build a house these days? And what costs will you have to pay that you don’t see coming? We’ll cut to the chase—for you nerds out there, the average cost to build a house in 2017 was $428,000. (1) That estimate is based on a 2,800 square-foot, single-family house—which makes the cost to build a house about $153 per square foot. That’s the technical answer. But before you rush off to the bank, hang on! There are different strokes for different folks. The cost to build a house is based on changing factors like size, location, labor, materials and current real estate trends, which make it impossible to nail down a perfectly accurate, one-size-fits-all answer. So let’s break down the average cost to build a house into each stage. Put on your hard hat, and read on. Okay, you want to build a house. Awesome. But the three little pigs did too. And we all know what happened to them. Two of the pigs had the dumb idea to build their houses out of straw and sticks. The other pig built a well-thought-out house of brick. When the wolf came along, the only house left standing was the one that was carefully built—brick by brick. Just like the three little pigs, to protect your future, you need to build a budget—brick by brick—before you build a house. First, this is a no-brainer, but if you haven’t already bought the property where your house will be built, find a quality real estate agent. These experts, also called buyer’s agents, will help you hunt down and negotiate a deal on land for the perfect location to build your house. A good agent will know where to find up-and-coming areas so you can plant roots in a spot that’ll make your home more valuable over time, which is what you want! Now, once you’ve found that lovely plot of land, get ready to make a lot of decisions! In each phase of construction you’ll make dozens of choices that affect the cost to build your house! You’ll need to start off with a well-planned, detailed vision of the home you want. And we don’t just mean the number of rooms and finishes. If you don’t decide on your budget, you’ll end up making a ton of change orders. To help you prepare for the decisions you’ll have to make at each stage of the home-building process, we’ve broken down the typical costs to build a home into separate stages, beginning with site work and moving all the way to landscaping—and even the final sales price. While we can’t read your mind and predict how much it will cost to build the house you have in mind, we can show you what costs to expect and when. Let’s dive in! 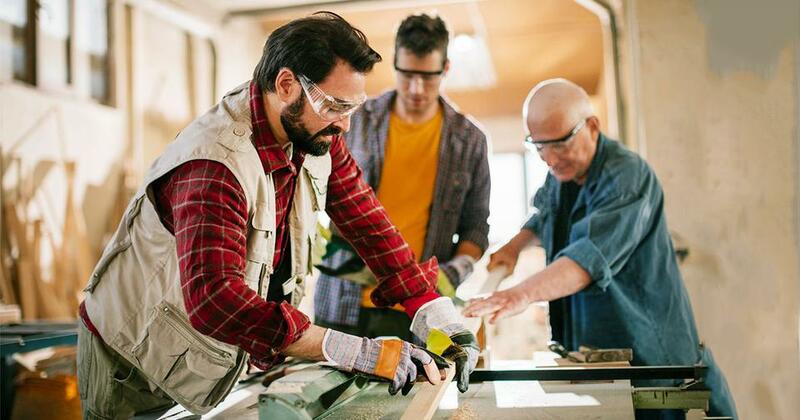 After you decide on your property, you’ll need to pay for site work—such as inspections, permits and building plans—to prepare for the actual construction. The steepest cost here includes fees for water and sewer inspections, which will, ahem...flush away about $5,000 of your budget. Next in line are the $4,000 of fees (give or take) to obtain a building permit. For engineering and architecture, you’ll need about $3,000. Pro tip: Have your architect and builder develop the plan together. Don’t let an architect who doesn’t know anything about building win you over with pretty pictures! Your builder can make sure your architect isn’t drawing something that’s ridiculous or super expensive to build. Remember, Uncle Sam wants his share too. The government will also charge you about $2,000 for something called an impact fee, which pays for public services like roads, parks, and water treatment in your new community. Lastly, leave room for a $2,000 buffer. Foundation work is where the real fun begins! This is when you’ll break ground on your new home. Breaking ground, or excavation, requires heavy-duty equipment and expert operators to make sure the land is level before laying the foundation of your house. And know that if a bunch of large rocks are hiding beneath your plot of land, excavation costs could shoot up. After excavation, your builder will lay the foundation for your home, which usually includes lumber and concrete. Homes with basements typically cost more than ones without because there’s more square feet to cover. Your house could also need retaining walls installed to hold back surrounding soil from crumbling and falling onto your foundation. Since foundation work requires specialty equipment, material and labor, the cost usually cuts into $25,000 of the budget, but prepare for an extra $1,000 just in case. The foundation sets up the success of every other building phase. Casually throwing together a "straw-and-stick" budget here could crush you with unexpected costs! So plan on these expenses, folks! Brace yourself. No, literally! The frame of your house will be one of the highest costs in your house-building budget—beaten only by interior costs and the sales price. This is when your house will start to take shape. 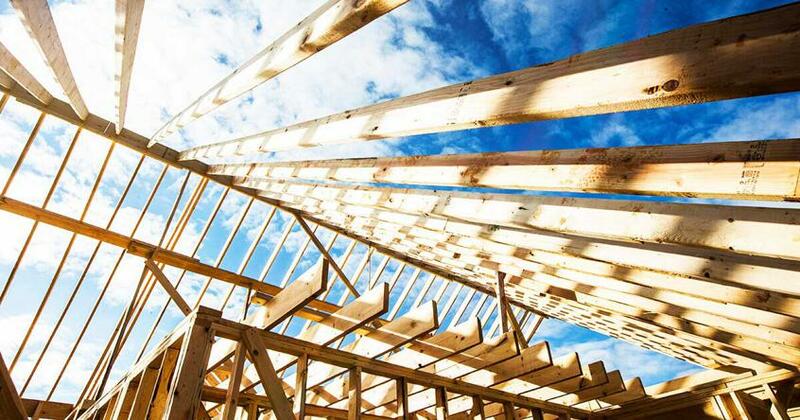 Building the skeleton of a house (including the roof) takes a ton of lumber, which can drive up the cost to $36,000 or more. If trusses—the fancy name for a series of triangular structures designed to support the roof—aren’t included in the cost to build the roof, they might add another $4,000 to the framing budget. Once the "bones" are in place, you’ll need to pay for sheathing—a flat layer of boards that cover and protect the frame and trusses. Think of it as the skin that covers the bones of your house. If you add metal or steel materials, your framing expenses will bump up the budget another $1,000. The exterior wall is an expensive line item ($15,000) because it covers the perimeter of your house, and that requires a lot of material. It also supports the roof and structure of the house and prevents outside weather from getting inside, ensuring that when the weather outside is frightful, your home will be delightful. Exterior finishes also include installing any openings in your house like doorways, windows and the garage. You can count on those costs being somewhere in the neighborhood of $9,000. Finishes on the roof will tack on another $8,000. This is another category where you’ll want to have at least a $1,000 cushion. Installing major systems in your house will cost about as much as the exterior finishes. Major systems include HVAC ($11,000), plumbing ($11,000), and electricity ($10,000). Sure, you could trim the budget here, but we’re assuming you’d like to avoid outdoor plumbing. Let us give you a heads up: These costs don’t refer to the actual fixtures (sinks, toilets and lights) that hook into plumbing and electrical systems. Those fixtures are grouped into the cost for interior finishes. On top of these major system costs, keep an extra $1,000 in your reserves. Get out your wallet. Besides the sales price, the interior is usually the most expensive step in building a house. This makes sense, of course, since you’ll spend most of your time and make most of your memories inside. Do you like granite countertops? Hardwood floors? Stainless steel? Whether you’re simple or bougie in taste, the finishes add up! There are a lot of expenses to cover, so let’s quickly break it down! You’re almost there! Just a few more bricks to add to your budget. The final steps to build a house bring us to outside items like landscaping ($6,000) and the driveway ($5,000). They also include surrounding structures like a porch, patio or deck ($3,000). And the final clean up can cost around $3,000. 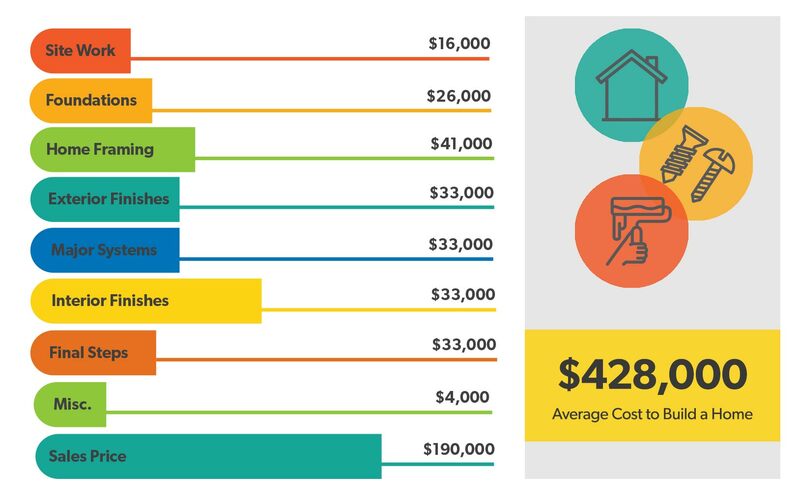 Above and beyond the "buffer" amounts built into each stage, the majority of home-building projects require $4,000 for a separate, miscellaneous category that goes toward the overall construction cost. So plan for that extra $4,000. As the final and heaviest brick of your house-building budget, you’ll need to plan for the sales price. Had you decided to buy an existing home (instead of building one), your sales price would be in the hands of the seller, their real estate agent and an appraiser. But when you build, the sales price is determined by your builder and a bunch of vendors. After the construction costs are handled, the price to purchase and own your new house includes several line items—the most expensive being finished lot costs ($92,000). Another whopping cost is the profit your builder and vendors make on the project, which can come in at about $46,000. Other budget items include overhead and general expenses ($22,000), sales commission ($17,000), financing ($8,000), and marketing ($5,000). That’s right. You probably never would have met the crew that builds your house if it wasn’t for their marketing and sales efforts, which are costs that get plopped into your lap. Whew! That’s a lot of information! So, after breaking down the cost to build a house, you might wonder if it’s cheaper to buy an existing one. Good question. Again, the factors that influence housing costs make it impossible to give a one-size-fits-all answer. Everyone’s dream home is unique—and so are the costs! With that said, the average sales price of an existing single-family house in 2017 was about $291,000. (2) If we compare that price to the cost to build a house ($428,000), it costs around $137,000 more to build a new house rather than to buy an existing one. Yikes! But remember, these are just averages. The cost to build your house is up to you. You have the power to make decisions on paper, on purpose before the shovel hits the dirt if you build your budget, brick by brick. Can You Afford to Build a House? If your budget allows you to pay cash to build a house, congratulations! You’re a rock star. The only other costs you’ll have to consider are property taxes, homeowner’s insurance, and, if your development is part of an HOA, other ongoing fees. If paying cash to build your house isn’t realistic for your timeline, make sure you know how much house you can afford to build. Don’t build a house with any type of mortgage besides a 15-year fixed-rate conventional mortgage with payments that are no more than a fourth of your take-home pay (including property taxes and insurance)! If you get a mortgage that costs more than 25% of your monthly income and charges more interest than a 15-year mortgage, you’ll sacrifice other financial goals. Instead, feel confident you’re getting a smart mortgage by talking with our friends at Churchill Mortgage. Ready to Build a House? Building a house is a huge undertaking! Start this project with an experienced expert who knows the process. Don’t know where to find one? Our free Endorsed Local Provider (ELP) program can help. Connect with a trusted real estate agent in your area who knows how to walk you through a house-building budget—brick by brick. Before you build a house, understand the pros and cons.